Dignitaries and workers gathered earlier this month at the construction site of the San Francisco Transbay Transit Center to celebrate the emergence of the first piece of structural steel visible above ground. The ceremony marked the project’s latest milestone and the beginning of the structural steel assembly process, which is scheduled to complete in mid-2016. More than 22,000 tons of steel will be used to construct the Transit Center, all of which was supplied and fabricated domestically in accordance with the project’s Buy America status. 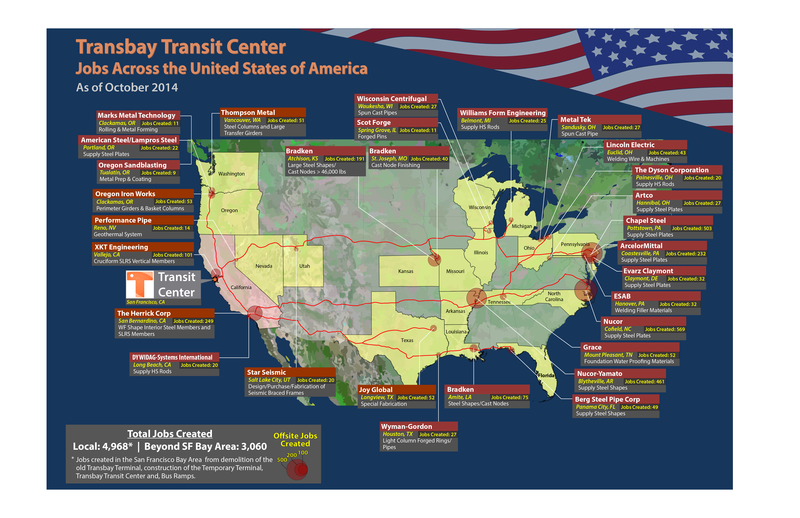 Production facilities in 19 states have been involved in providing the steel for the Transit Center, several of which are AISC members and AISC certified facilities. View a map of the various facilities. The project has created more than 8,000 construction-related jobs to date, almost 3,000 of which are associated with steel production. The project features an innovative design that requires many different types of steel elements, some single pieces as large as 65 tons. The steel pipe columns and cast nodes that form the exoskeleton of the structure are engineered to exact specifications that are test-fitted at the fabrication site to ensure quality. And the column put in place during the ceremony, as well as all columns that will be installed, features a seismically safe design not used before in the U.S., according to a release by TJPA. When finished, the Transbay Transit Center will accommodate approximately 100,000 travelers daily. Bus operations are scheduled to begin in late 2017. To learn more about the project, visit www.TransbayCenter.org.